Manchester Derby: Iheanacho Set to End Mourinho's Dream Start in Man United? Manchester Derby: Iheanacho Set to End Mourinho’s Dream Start in Man United? The City of Manchester would literary be on standstill as Manchester United will welcome eternal rivals, Manchester City in Saturday’s early Premier League kickoff at Old Trafford (12:45pm Nigerian time). The big encounter which has drawn so much media attentions globally will see two of the greatest coaches in the world, Jose Mourinho of Manchester United and Pep Guardiola of Manchester City renew their rivalry in England. In 16 meetings, the Portuguese has emerged victorious only three times with Guardiola winning seven of those encounters, including a famous 5-0 win over Real at the Nou Camp in November 2010. Although less emphasis would be shown on the players, however, Super Eagles attacking midfielder, Kelechi Iheanacho will be hoping to rain the goals that will wreck Mourinho’s dream start in the Premier League. The Nigerian international was a revelation for the Citizens last season as he scored 11 goals in the league and is likely to replace suspended Sergio Aguero in the attack. The England FA charged Aguero with violent conduct following an elbow on West Ham’s Winston Reid. Iheanacho had a brilliant preseason campaign for Guardiola prior to the new EPL season, which means players such as Wilfried Bony and Samir Nasri were cut out from the team. He may not be a deadliest striker such as the likes of Manchester United’s Zlatan Ibrahimovic, Chelsea’s Diego Costa, Totttenham’s Harry Kane, and Barcelona’s Luis Suarez, however, the FIFA U-17 winning player remains a threat in the attack if giving a slim chance in the 18-yard box. His recent sublime goal in Nigeria’s 1-0 win over the Taifa Stars of Tanzania in a 2017 Africa Cup of Nations qualifier would have send a warning signal to the defensive duo of Manchester United’s Eric Baily and Daley Blind. Quick and blessed with lightening pace, Iheanacho, who recently won the CNN goal of the week award for his goal against Tanzania, could be the X-factor for Guardiola considering the fact that the youngster shooting statistics – he averages nearly one shot per game – show he isn’t short of confidence either. “Sergio’s suspension is a big loss but we have a lot of big players to turn to. If I get picked I’m going to do my job. Games like this mean a lot and it doesn’t come bigger than a derby. 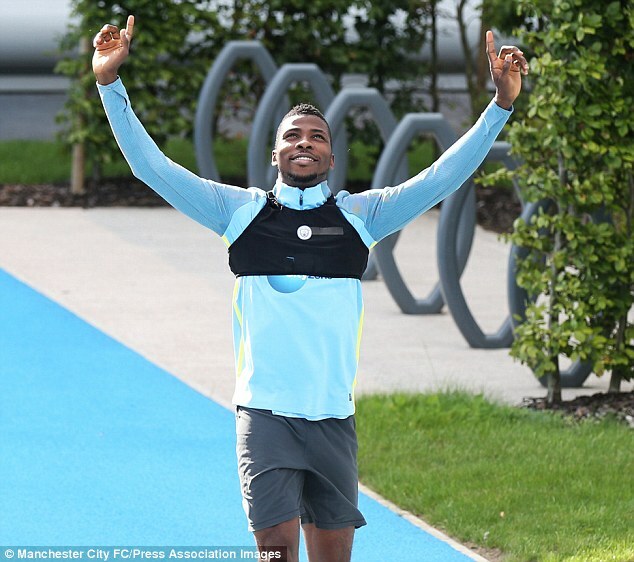 He’s a winner and I believe he will bring success to the club,” Iheanacho said as quoted by The Sun. Statistically, as of the 20th of March 2015, there have been 171 competitive meetings between the teams. United have won 71 and City 49, the remaining 51 games finishing as draws. The biggest victories have been to City who have won 6–1 on two occasions in the official league (both times in the away fixture at Old Trafford) on 23 January 1926 and 23 October 2011. But on 14 April 1941 during a war league derby match at Maine Rd, United beat City 7–1, which remains the biggest victory between the two sides overall, this result has been omitted as the official league was suspended but the derby still continued. Both teams have won 5–0 once (City in 1955, United in 1994).